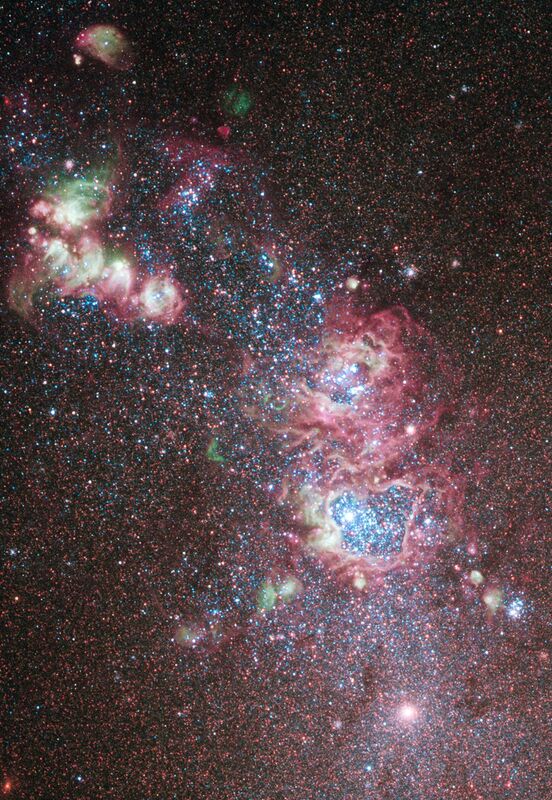 The dwarf galaxy NGC 4214 is ablaze with young stars and gas clouds. Located around 10 million light-years away in the constellation of Canes Venatici (The Hunting Dogs), the galaxy's close proximity, combined with the wide variety of evolutionary stages among the stars, make it an ideal laboratory to research the triggers of star formation and evolution. Intricate patterns of glowing hydrogen formed during the star-birthing process, cavities blown clear of gas by stellar winds, and bright stellar clusters of NGC 4214 can be seen in this optical and near-infrared image. Observations of this dwarf galaxy have also revealed clusters of much older red supergiant stars. Additional older stars can be seen dotted all across the galaxy. 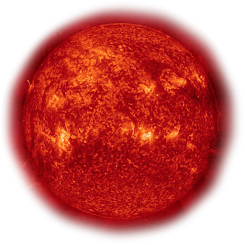 The variety of stars at different stages in their evolution indicates that the recent and ongoing starburst periods are not the first, and the galaxy's abundant supply of hydrogen means that star formation will continue into the future.